12dc in circle, close circle pulling loose thread, sl st to top of ch3 on beginning of row. Next Row - ch3, work 2dc in each dc to end, sl st to top of ch3 on beginning of row. next dc, (second ear made) sl st in next 16dc, sl st to first sl st. Fasten off. Next Row - ch1, work 2sc in each sc to end, sl st to first sc on beginning of row. DNT. mouth (see picture) decorate with a ribbon bow etc. 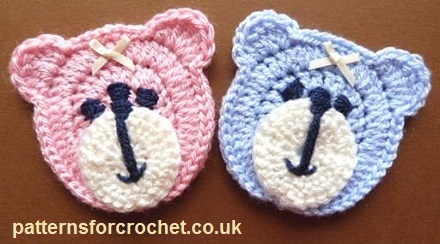 Hope you enjoy this free crochet pattern for teddy bear applique.